No word on cast yet. NBC, which optioned DC Vertigo's occult con-man drama Constantine last September, has greenlit the series pilot. Man of Steel's David S. Goyer will executive produce the series, while The Mentalist's Daniel Cerone will write it, and also act as showrunner. No word on casting yet, so there's still a chance that [insert name of your favorite actor here] may get the role. Actually, The Mentalist's Simon Baker wouldn't be a bad choice; he's certainly got the right look. Hellblazer first got its start, way back in the mists of time, as an offshoot from Alan Moore's Swamp Thing. John Constantine first appeared as a mentor figure for Swamp Thing, guiding it through nightmare-strewn American Gothic towards the Crisis on Infinite Earths. Constantine got his own title soon after that, and remained a mainstay of DC's Vertigo line until relatively recently, moving to the New 52 in 2012 as one of the Justice League Dark leads. 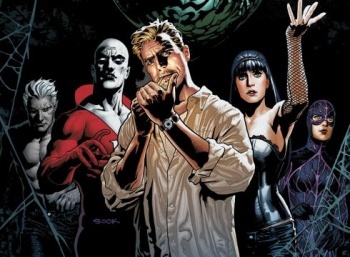 Justice League Dark, coincidentally, is getting some attention from Guillermo del Toro, and may yet get a movie of its own. There's no telling where this one will end up, but at least you've a pilot to look forward to. Presumably it won't be borrowing from any of the Vertigo storylines, which is a bit of a shame; I wouldn't mind seeing John take on evil sadist Batman-a-like, S.W. Manor. Or better yet, help ghost J.F.K. recapture the White House in Hell. Mind you, if I had to make any one prediction for the TV series, it'd be this: those trademark cigarettes are gone, gone, gone. Constantine might be able to summon demons from the nethermost pit, but tobacco use may be a step too far for NBC.